Exactly What is a Smart City and Why Should You Care? If you're among the nearly 80 percent of Americans that live in a city, you may have noticed the urban landscape around you changing. As urban areas worldwide cope with an increasing number of residents, cities are turning to smart, internet-connected technologies to update infrastructure, improve livability and meet head-on many of the challenges of the 21st century. Collectively, these technologies comprise the vision of the smart city. A smart city is a modernized urban area where everything – from transit to schools to utilities – can be connected to digital technology that enables the two-way transfer of information from the city to the citizens. Using smart tech, city officials can interact directly with the community and the city’s infrastructure to monitor what’s happening in the city, how the city is evolving and what new services may be needed – with the end goal of enabling a better quality of life for all residents. Many cities throughout the United States are already beginning to implement smart city projects. In New York, the LinkNYC program is transforming 7,500 former payphones into digital communication hubs with free Wi-Fi, mobile device charging, national calls, directions and access to city services – all paid for by advertising. Boston has implemented solar-powered benches that allow citizens to charge their cell phones and also provide environmental data that's used to improve the city's livability. San Jose is using air, sound and climate sensors to feed an internet-based platform focusing on improvements to public safety, transportation, public health, economic growth and more. A key area of focus for smart tech improvements has been energy usage. Anchorage, Alaska recently announced a plan to equip old streetlights with LED bulbs that can be controlled and monitored remotely – saving the city on energy costs while keeping the streets safe and lit. In the mountains of southern Tennessee, Chattanooga modernized its electrical grid, reduced power outages and offered its citizens an exceptionally high-speed internet service. A university study showed these improvements created at least 2,800 new jobs, attracted new businesses and provided an $865.3 million boost to the local economy. These energy-related improvements are part of the smart grid -- a cornerstone of the smart city. The smart grid is a modernized electrical grid that – just like other parts of the smart city – is able to transmit data between the energy provider and the energy consumer. The smart grid enables innovations like smart meters, smart appliances, renewable energy (for example, wind and solar) and energy efficiency resources. The two-way communication enabled by smart grid technology helps make useful data more accessible to consumers and city services. Smart grid also creates the possibility for electricity to be carried from places where it is generated to consumers. Integrating renewables like rooftop solar power is a game changer for creating more sustainable, livable cities. Smart grid also allows the more complete integration of new technology like electric vehicles, which, in turn, creates a bevy of possibilities down the road for urban areas. Future possibilities would include city-wide, zero-emissions transportation and electric vehicles that act as power storage in case of emergencies. And finally, as smart grid helps consumers access their energy data, it enables utilities to offer new pricing programs that can lead to increased energy efficiency. Outside of Denver, just down the road from Denver International Airport, developers are working with companies like Xcel Energy, Panasonic and Silver Spring Networks to create a sustainable, transit-oriented community that brings together many of the key ideas of the smart grid and smart city. Modeled after a town west of Tokyo that was built on the site of a former Panasonic factory, Peña Station will incorporate renewable energy, smart LED street lights, community Wi-Fi, smart parking, environmental sensors and an electric driverless shuttle, to name a few of the innovations. Ultimately, the global trend toward urbanization is putting pressure on existing city services and systems. More people means more complications for public safety, health, transportation, energy, water and more. But by making the smart city and smart grid a reality, we can create more sustainable, livable and prosperous cities for today's residents and future generations. 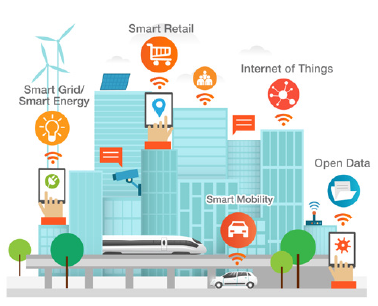 Interested in learning more about smart cities and the connection with the smart grid? Check out our latest fact sheet.